With safety in mind, anti slip tiles (or non slip tiles) are invaluable wherever there's likely to be spillage of liquids or where kids and dogs like to race around. Anti slip tiles offer you a safety net against accidents, when customers ask our advice on which tiles to use in areas which are prone to wet and slippy conditions are the Mantle Riven Range. It is imperative therefore that areas of increased slipping hazards, are dealt with by using the correct products achieving, safety, general tile performance, and ease of cleaning for the customer. Anti Slip tiles are mainly used in area such as commercial kitchens, shop entrances, conservatories, and walk in showers. 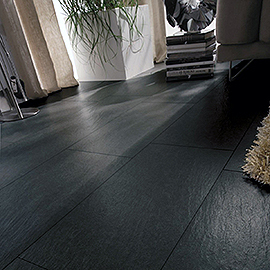 Check out our great range of anti slip floor tiles here. Tile Choice presents you with an exquisite range of non-slip floor tiles in a wide selection of colors, textures, shapes and styles that would suit your taste and budget. The home is a place where we look for complete security and safety but unfortunately sometimes accidents like slipping over on a wet floor can occur. A house where there are pets, children and elderly people especially should take these risks into consideration. To minimise these risks you can use anti-slip tiles in areas which are likely to be getting wet regularly. 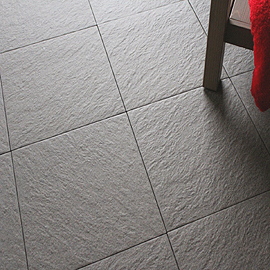 Most commonly anti-slip tiles will be used in bathrooms, wet rooms, swimming pools and patio areas. Most anti-slip tiles have a rougher textured surface which assists in increasing the rate of friction between our feet and the floor which we walk on. What makes non-slip floor tiles an important interior addition? Usage of non-slip floor tiles are not limited to just bathrooms and kitchen, they are even useful for hallways and conservatories especially if staircases or steps are present. Or in areas which people may be regularly coming from outside to in whilst wearing wet or muddy shoes. A spilt drink, water or even some drops of oil on a floor can go unnoticed and could prove fatal if someone was to slip. Before somebody gets injured, installing non-slip floor tiles is the ideal solution. They are highly durable, easy-to-clean and look attractive. Why to buy non-slip floor tiles from Tile Choice? Tile Choice not only offers the practical non-slip floor tiles but also offers them with superior quality and amazing designs. We regularly upgrade our collection of products so they meet all modern production standards and requirements. We believe that all products should be technologically advanced as well as being functional and looking great. 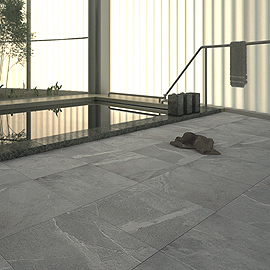 Use our non-slip floor tiles anywhere – be it your bathroom, walk-in shower, ramps, swimming pools, shop entrances, garden patio, staircases etc. We can guarantee the end result will be a safe flooring surface with a high quality look. Still confused? Contact us for more information or request a free sample online to see for yourself.